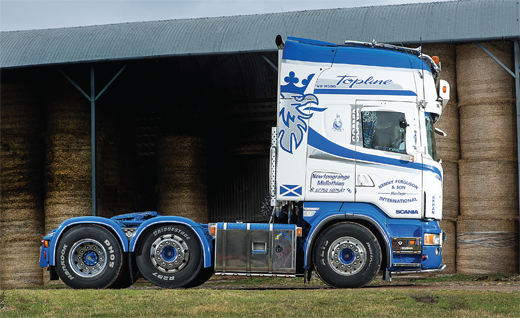 Owning and running your own truck as an independent haulier was never easy. Today, it’s tougher than ever. It’s hard work, with high investment required, and there are always risks involved. So is it really still a viable career? Yes, and we met with one of those success stories. 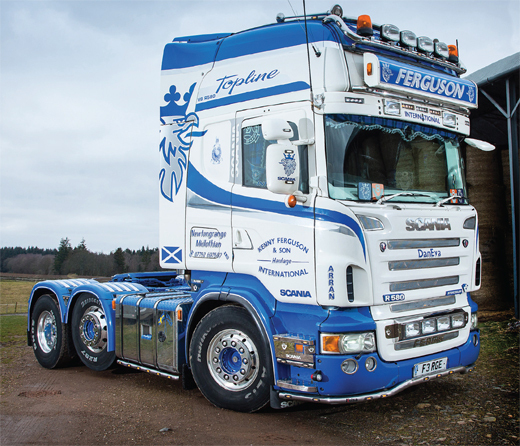 Kenny Ferguson has been running his own truck since 2006, and upgraded to an immaculate Scania R580 V8 Topline at the end of last year. You’ll often hear the phrase “it gets in your blood”, but what does it mean? It’s one of those things you’ll either understand or you won’t. 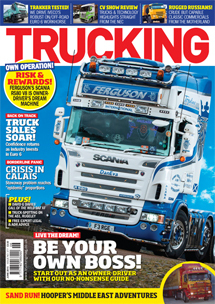 Driving a truck is a difficult task, with bewildering regulations, ever more Health and Safety to deal with, and sometimes it just feels like everyone and their brother is out to get you; car drivers, VOSA, the police, the Highways Agency. Nobody said it was easy. Then again, when you get a good day, when the skies are clear and the sun is shining (or the moon, for that matter) and the road is open, there’s nothing quite like it. The urge to be on the move, to travel from one place to another, that’s what grows. It’s almost inexplicable. It draws people in, and once you’re there, it’ll never let go. “I first drove an old DAF artic around a field when I was 10 years old, and ever since then…” laughs Kenny as he walks away from his pride and joy. Like many of today’s drivers, Kenny became interested in haulage an Newhaven, Brocklebank of Broxburn and Pollock Scotrans. “Back when he started out, there wasn’t even an HGV licence,” remembers Kenny. “The first truck he drove was an old Atkinson, and all you did back then was pick it up as you went along. You’d get a load to take to Manchester and you’d learn to drive along the way! He was a great mechanic, too – proper old school. He’d repair anything.” Kenny used to skip school to go on trips with his Dad in a Volvo F86. “I used to lie to him about what subjects I’d miss if I was out with him. ’Oh yeah, it’s only Home Economics and PE Dad, nothing important.’ He’d make me duck down in the passenger seat when we drove past the school,” he says with a grin.